Russian investigators said Friday that a New Year’s Eve blast that killed 39 people was likely the result of a gas explosion, dismissing reports that the Islamic State group was behind it. 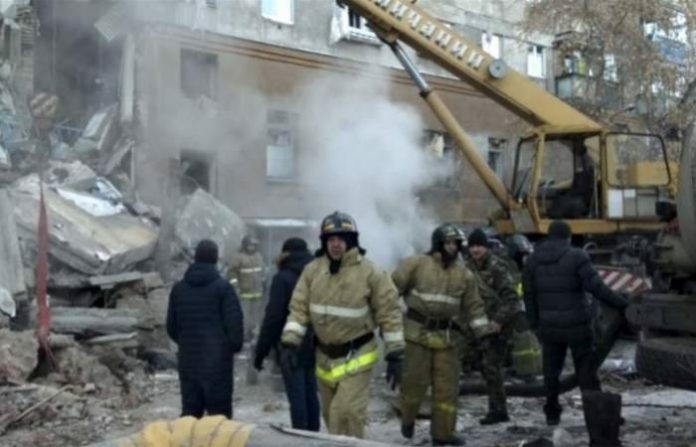 The Investigate Committee said it was still investigating the explosion that ripped through an apartment block in the Urals city of Magnitogorsk, killing 39 people. On New Year’s Day, three more people died when a minibus exploded not far from the affected building in the city. On Thursday, an article in the Islamic State’s weekly Arabic-language newspaper al-Naba said the group was behind the blasts. It said the Islamic State group did not claim responsibility earlier for “security reasons”. IS claimed the operation was carried out by members of its Caucasus branch, the media outlet said. The Investigative Committee said it was too early to draw any conclusions as a probe was still under way. “Conclusions about the circumstances of the tragedy in Magnitogorsk will be made following a set of investigative measures,” spokeswoman Svetlana Petrenko said in a statement. She said a gas explosion was still the investigators’ main line of inquiry, even though they were considering all possibilities. A spokesman for the FSB said the security service would not comment. “All information will be published shortly,” he told AFP. Immediately after the apartment blast, President Vladimir Putin and top ministers rushed to the scene of the tragedy, while the FSB quickly ruled out foul play. Shortly after the explosions two local media outlets, citing law enforcement sources, said the apartment block blast was likely the result of a terror attack.